Treatment of kidney cancer (renal cell carcinoma) depends on a number of factors, including the tumor's size, its staging, its aggressiveness and spread, and the patient's age and overall health. Stage III: when the tumor is growing in a major vein or into the adrenal gland, or when the cancer has spread to nearby lymph nodes but not distant lymph nodes or other organs. Stage IV: when the cancer has progressed beyond the organ and lymph nodes and metastasized in tissue that encases the kidney, or in the liver, lungs, or other tissues. 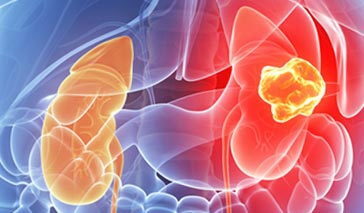 The most common type of kidney cancer is renal cell carcinoma, which comprises more than 90 percent of all kidney cancer cases. The treatments described below address this type of cancer. The primary treatment for almost all renal cell carcinomas in stages I, II, or III is surgery to remove the cancerous tissue. When cancer has metastasized to other organs, surgery is also done to remove as much cancerous tissue (lymph nodes, tumors, etc.) as possible. Depending on the cancer's progression, surgeons can choose among a few different types of kidney surgeries, including nephrectomies (which involve removing part or all of the kidney) and ablations. Partial nephrectomy: the current gold standard, according to the Society of Interventional Radiology. This surgery leaves healthy kidney tissue intact, removing just the cancerous portion, and is typically performed for those with smaller tumors (those under 7 cm in diameter). Radical nephrectomy: involves removal of the entire kidney, along with its adrenal gland, and occasionally the surrounding tissue and affected lymph nodes. If the adrenal gland is unaffected and the cancerous tissue is on the opposite side of the kidney, a surgeon may sometimes be able to leave the gland in place. Laparoscopic or "keyhole" nephrectomy: when a surgeon makes small cuts in the abdomen so as to insert a small tube with a camera (or laparoscope) and uses long, thin instruments to remove diseased tissue without a large incision. Laparoscopic surgery typically results in less pain and a faster recovery than traditional surgery. In some cases, after a patient has one kidney removed, the remaining kidney is unable to function properly. This can mean that blood is not getting filtered adequately and dialysis or even a kidney transplant may be necessary. More surgeons are starting to use thermal techniques for smaller tumors as alternatives to surgical resection--because they spare the majority of healthy kidney tissue, these approaches are less invasive and easier on patients. They can be combined with other treatment options, repeated if necessary, and can be performed under general anesthesia or conscious sedation. Cryoablation: uses extreme cold to burn away cancerous tissue in tumors smaller than 4 cm, though larger tumors can also be treated depending on location and size. A tiny probe is inserted though a small incision with imaging to guide the cryoblation needle to the tumor, and most patients can be sent home the same day. Radiofrequency ablation: kill the tumor with heat, sparing healthy tissue. The approach is generally used on tumors smaller than 5 cm, because larger tumors require more extensive treatment. It is easier on patients than systemic therapy and most people can return to normal activities within a few days. Although renal cell carcinoma isn't very responsive to more traditional approaches, such as chemotherapy and radiation, oncologists have a few other systemic treatments from which to choose. Cytokine therapy (interleukin-2 or interferon) can be used for stage IV, inoperable renal cell cancer when other treatments are not possible. But while interleukin-2 can be effective for 10 to 20 percent of patients, it also has serious side effects (including extreme fatigue, difficulty breathing, fluid in the lungs, and heart attack). Interferon has less serious side effects, including vomiting, fatigue, and fever. New therapies (sorafenib, sunitinib, and everolimus, among others) are made to directly target proteins or other molecules that fuel cancer cell growth, and they have been shown to be effective at slowing the formation of new blood vessels (a process called angiogenesis) or the growth and rapid division of cancer cells. Arterial embolization is used in patients with advanced renal cell carcinoma that has spread to nearby veins and structures. During this procedure a catheter (small tube) is placed in an artery supplying blood to the kidneys and the tumor. A special liquid agent is injected into the tube that blocks the blood flow into the kidney, which causes the tumor to shrink. In some cases the tumor can shrink enough that patients can then undergo surgery or thermal ablation. In other patients, the embolization serves to improve quality of life. The given prognosis for kidney cancer depends on a number of factors, such as whether the tumor has spread to the lymph nodes, any other organs, and the size of the tumor. Prognosis is normally given in five year increments: Ninety-five percent of people with stage I kidney cancer survive five or more years after treatment. Around 70 percent of patients with stage II disease survive five years or more. Stage III prognosis depends upon where the cancer has spread, and the five year survival rate ranges from 40 to 70 percent. About 10 percent of people diagnosed with stage IV cancer survive five years or more. 1. Garg S, Batura D, Biyani C, Gill I. Laparoscopic surgery for cancers of the kidney: long-term oncological efficacy. British Journal Urology International. December 2008;102(11):1498-1501. 2. Haen S, Pereira P, Salih H, Rammensee H, Gouttefangeas C. More than just tumor destruction: Immunomodulation by thermal ablation of cancer. Clinical and Developmental Immunology. August 2011, 19. 3. Koneru R, Hotte S. Role of cytokine therapy for renal cell carcinoma in the era of targeted agents. Current Oncology. May 2009; 16: S40-S44.